Full of practical tips and examples to help take your skills to the next dimension. “Autodesk AutoCAD 2013 Practical 3D Drafting and Design” will take you beyond the 2D frontier and help you create accurate 3D models that simulate reality. This book is crammed full of creative and practical tutorials which will help you master the third dimension. From exercises on coordinate systems to creating solids and surfaces from 2D, you will wonder how you ever designed without this resource by your side. “Autodesk AutoCAD 2013 Practical 3D Drafting and Design” is full of hands-on studies and projects that will help develop your 3D skills. 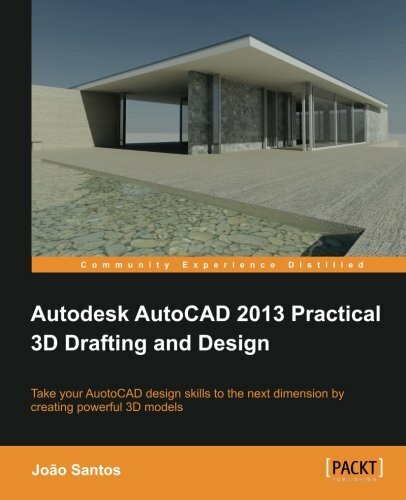 Starting from the assumption of only a very basic knowledge of AutoCAD, this book will help you master 3D visualization and coordinate systems, create 3D models from 2D drawings, and from basic shapes, measure volumes, and other information, obtain 2D construction drawings from 3D models as well as how to apply lights and materials to get photorealistic images. Learn how to create basic 3D shapes and models. View and navigate 3D models. Apply user coordinate systems to define workplanes. Create 3D models from 2D drawings. Apply 3D basic shapes and modify 3D models. Master AutoCAD Lighting and materials effects. Obtain information from 3D models, like volumes and inertias. Create photorealistic images of your 3D models. This book is written in a practical and friendly style with practical tutorials, exercises, and detailed images which will help you master the third dimension. This book is intended for everyone who wants to create accurate 3D models in AutoCAD, like architecture, engineering, or design professionals, and students. Only basic understanding of 2D AutoCAD is needed.